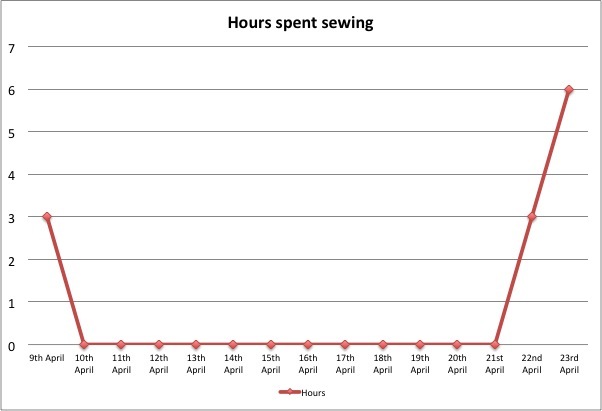 I've kept track of my sewing productivity over the last 15 days for the Sewing Productivity Project and can now reveal the results. They're not great. But it has been a learning process! How many hours per day do you sew? As you'll see from the chart below, I had quite a long drought period of no sewing whatsoever for 12 days, sandwiched between spurts of intensive stitching. I was away at a wedding last weekend and the weekday evenings were spent either seeing friends, being zombified with a cold, or both. The time spent sewing averages out as 48 minutes per day, which doesn't seem that low, but I'd really like to maintain a bit more consistency in my productivity. What are you spending/wasting the rest of your free time doing? The majority of my free time is spent on social engagements (seeing friends and family, Skyping my boyfriend, hanging out with my new flatmate...). This is probably how it should be, but the misanthrope / complete saddo in me sometimes wishes I could spend more time sewing! 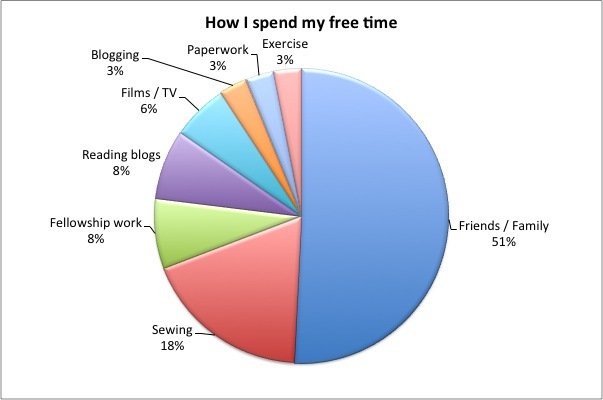 I'm not too shocked by the amount of time I spend doing other things. I should maybe cut down the time I spend reading blogs, but you guys are just too inspiring! I'd basically like to do more of everything - more sewing, more exercise, more films, more work... without having to sleep any less. Is that possible? When you do sew, how do you feel before, during and afterwards? Bursts of stitching have been preceded by days of excitement, dreaming and generally wanging on about how I can't wait to have time to sew. During sewing, I felt pleasure from creating something with my hands, a sense of calm from getting into the zone and satisfaction at seeing something come together. Afterwards I felt physically achey from bending over my sewing table, a sense of achievement and an urge to do more more more! What factors are you aware of that impact upon when you make time to sew? - I generally feel physically tired after work (not that I work on a building site or anything), so by the time I've cooked and eaten dinner, getting down to sewing can be quite difficult. I find it much more appealing to start sewing at the weekend. - Having lots of things to do, with pressing deadlines, makes me feel guilty about spending time sewing. I made an agreement with myself in advance to block out Day 15 for sewing and hid my 'to do' list, which made me focus and get down to business. - Sewing with other people helps. Day 1 was Craft Club, dedicated sewing time with a social element. It feels more of a thing and you feel motivated to complete a project (however small) by the time everyone has to go home. - This is controversial, but if a UFO really isn't appealing, leave it and start something that you're excited about making. My trousers have been sitting on my table half finished for a month and the smart dark grey fabric just isn't doing it for me with the summer weather, so I'm giving them a rest and making Simplicity 7341 instead. 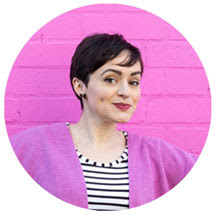 - While I do spend a bit too much time reading blogs when I could be sewing, seeing what other people are making is great motivation for me to get going. 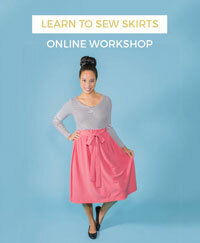 What are you learning about sewing productivity from this process? What tips can you share? 1. Decide what you're going to make in advance, so the thinking time doesn't eat into your precious sewing time. I could have got a lot more done on Day 1 if I hadn't been faffing about choosing between different projects. 2. Make sure you have all the materials you're going to need, gathering them up when you're out and about in the previous week. There's nothing more frustrating than sitting down to sew and realising you don't have any matching thread in your stash. 3. The optimal chunk of time to spend sewing is probably 3 hours (with tea and stretching breaks). Shorter bursts mean having to review the instructions and spend some time getting back into it. Longer bursts cause back ache! 4. Having a tidy sewing space - and preferably a tidy house - is a must for me. I like to be able to see where everything is and have space to lay out the instructions and the project pieces. 5. Don't feel guilty about blocking time out in your diary for sewing and saying no to social engagements if necessary. I find it really important to have time alone to do something creative, and I'm not a great person to be around if I haven't got that out of my system! 6. Having abandoned your friends, you can listen to the radio while sewing to make it seem like you do have a social life after all. I love Adam and Joe and Jarvis Cocker's Sunday Service and am not ashamed to say I often feel like they're in my sitting room with me, I just can't see them when my eyes are glued to the machine. Okay, so I am a little bit ashamed. Thanks to everyone who is taking part. Next week I'll compile an uber list of productivity tips, so please leave your tips in the comments below, and if you're writing posts about this please leave a link too. Let's go!